A "yes" vote for Proposition 12 would create new minimum size requirements for confinement pens and three other animals and require all egg-laying hens be cage-free by 2022. SAN FRANCISCO — California voters are right to think they already weighed in on how big cages should be for egg-laying hens. In 2008, voters ushered in Proposition 2, which sought to free egg-laying hens from tiny cages. It didn't outlaw cages but barred California farmers from keeping hens — as well as calves raised for veal and breeding pigs — in pens so small they virtually couldn't move. Since then, supermarket shelves have filled with cage-free egg varieties. Corporations like McDonald's, Costco and Taco Bell have committed to using cage-free products. But a decade later, voters are being asked to revisit the issue with Proposition 12, the Farm Animal Confinement Initiative. The Humane Society of the United States, the issue's primary proponent, says the measure is needed to update California standards and to apply those standards to out-of-state farmers selling their products in California. The earlier initiative simply stated the three types of animals must be able to turn around freely, stand up and fully extend their limbs — but set no specifics. A "yes" vote for Proposition 12 would create new minimum size requirements for confinement pens for all three animals and require that all egg-laying hens be cage-free by 2022. It would also ban the sales from other states not meeting California's standards. The Humane Society calls the measure a "commonsense reform" that strengthens a decade-old animal cruelty law and gives farmers a phase-in time to shift to more humane practices. 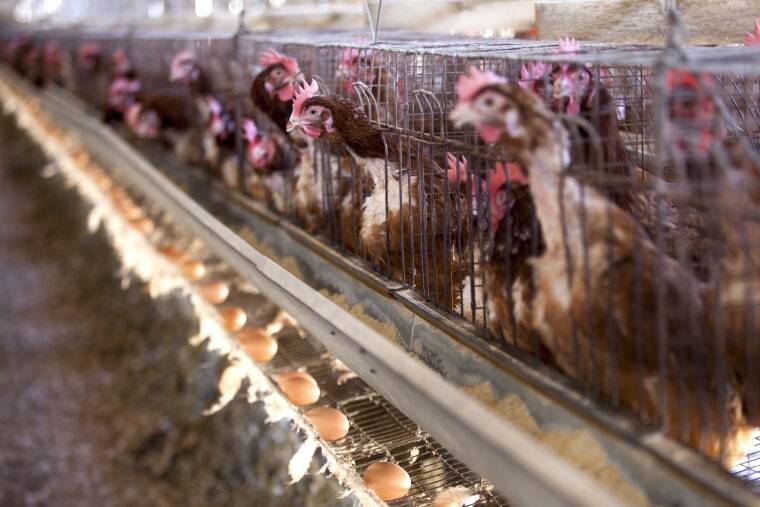 "Most of the eggs sold in California come from birds confined in cages where it's hard for them to even move. They have to eat, sleep, defecate and lay eggs in the same small space every day for their entire life," said Josh Balk, vice president at the Humane Society of the United States. "Proposition 12 ensures that the pork sold in California, the veal sold in California and the eggs sold in the state come from (animals) not confined in cages." Specifically, the measure would require, starting in 2020, a calf confined for production to have at least 43 square feet (4 square meters) of floor space to roam in, while each pig would have to be given 24 square feet (2.2 square meters) of floor space starting in 2022. Egg-laying hens, starting in 2020, must be given 1 square foot (0.1 square meter) of floor space each, and have to be cage-free by 2022, according to Proposition 12. According to findings of the state's nonpartisan Legislative Analyst's Office, the measure would likely result in an increase in prices for eggs, pork and veal partly because farmers would have to remodel or build new housing for animals. "Changes in housing systems, which come with significant costs that increase food prices, should be driven by consumer purchasing decisions, not the agenda of any activist group," Jim Monroe, National Pork Producers Council spokesman, told the Los Angeles Times. The Association of California Egg Farmers also opposes the measure, saying the expedited timeline could lead to supply disruptions, price spikes and a shortage of eggs for sale. The Legislative Analyst's Office concluded that if approved, the measure could cost the state as much as $10 million a year to enforce, and millions of dollars more per year in lost tax revenues from farm businesses that choose to stop or reduce production because of higher costs. Other opponents of Proposition 12 say it doesn't go far enough to stop animal cruelty. Bradley Miller, a spokesman for Californians against Cruelty, Cages and Fraud, which is leading a "No on Proposition 12" campaign, says the measure is misleading because the phase-in period implicitly makes cages legal until at least 2022. "We're opposed to legalizing cages in our state," said Miller, who is also president of the Humane Farming Association. "These are ever-changing, never-arriving deadlines."